During the past few months, our nearly 5 year old son has begun to protest against taking naps. This is something new because he has always loved to sleep. He actually needs to take a nap otherwise he will fall asleep right before dinnertime without fail and will be a huge grouch if we wake him up. Something we have noticed about our preschool-aged son is that he is very focused on food. 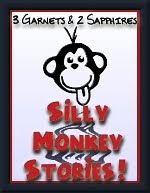 I have even written a Silly Monkey Story about how he has a one track mind when it comes to food. I have decided to use this to my advantage and have successfully done so many times. Everyday when I pick the twins up from preschool, our son will ask what we will be having for lunch. Sometimes he or his sister makes a suggestion. For example, yesterday our daughter suggested that we have cheese baked between two tortillas, something I have made for them many times before. On this day, however, she suggested that we add bacon. This idea was very appealing to everybody, so I told them both that we could have bacon in our lunch if her brother took a good nap. Right away, he knew he was defeated. Never underestimate the power of bacon.